Moving as a couple for the first time can be incredibly exciting, slightly overwhelming, and definitely stressful. The logistics required to do a safe, cross-country move for the cheapest price can become a tricky hurdle to clear. When I finished my undergrad and got accepted into grad school out on the east coast, we were so excited about the adventure that lay ahead. And when I say adventure I am including the requirement to move myself, my pregnant wife of 27 weeks and all our belongings 2000 miles from our little apartment on the west coast. As you can probably imagine there is an overwhelming amount of options that first time movers can explore. These options include factors that could impact the safety of your belongings, your finances, and your mental sanity. 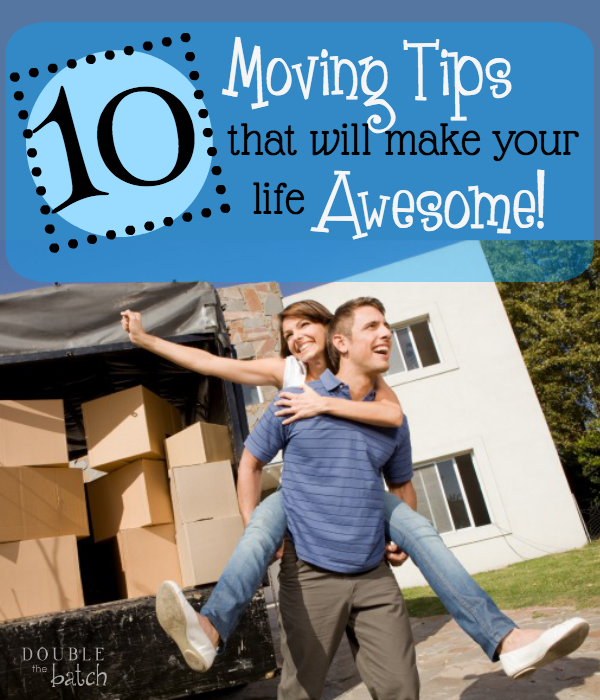 Below is a list of the top ten moving tips that will make your life awesome! Some of these we followed from the start and some of these we learned along the way. We hope they can be of assistance to anyone else anticipating their own long-distance move adventure. It should be noted that this list is not designed to be an exhaustive list of all of the things that need to be covered, simply an overview of some of the greatest lessons we learned through our experience. There is a wealth of information online about things you need to do before you move. What worked best for us was to take as much information as possible at the beginning of our moving process and create a to-do list of all of the items we wanted to cover and a timeline that we wanted to get them done in. This list was vital for us—we referred to it all the time during the process, and it was easy for us to add/remove items as we needed to. Especially because of all of the complexities that are involved in a move, it was therapeutic to see items scratched off a list and visualize the progress that you have made. It’s a big task! The urge for us was to buy a house before we moved out so that we didn’t have to “waste” money paying rent and so we didn’t have to move twice. We did a lot of research online from crime rating websites to calling police stations to try to find the best area to live in, and we thought we had a good idea of the “safe” areas. Even having done that, we didn’t feel comfortable enough purchasing a home we hadn’t seen in an area we hadn’t experienced. We buckled down and decided to get an apartment with a short-term lease so we could actually be in the areas we’d been exploring. We are so grateful that we did! The area that we had considered moving into was much worse than we thought it was and the friendly southern people were quick to tell us what they knew about each area. It took us a couple months of being here and an excellent realtor of 15 years to discover what was most important to us, and what to look for in a house for our situation. So take-home lesson: No matter how well you think you know the area you want to move into through your own searching, nothing can replace personally seeing the places and hearing the testimonials of the people in the area. 3. Recognize the different moving company options that are available for you. Do-It-yourself—You box up all of your things, pick up the moving van, load the moving van, drive the moving van, unload the moving van, and drop it back off at the terminal. There is insurance that was available for these companies, but that was not included in the price. Penske—We had Penske quote us $1750 for our move using a 16-foot trailer. This price does not include gas or the hassle of having to drive a 16-foot truck and a car trailer across the country. Every time we would have to stop to eat, get gas, sleep, or stretch our legs, we would have to maneuver that trailer. This is fine if you are an expert in how to do that, but I was not an expert in driving with a trailer. Uhaul—Uhaul quoted us $1530 for the same truck/trailer package as Penske. Uhaul will often come in a little lower than Penske, but does not guarantee your truck at your selected location on the day of your move. This could mean you have to drive several miles (up to 100) out of your way on the day that you need your truck. Logistically you can see the problems this might cause not to mention unnecessary additional stress. Full-Service Movers—We called a few different companies, but I am only listing one since we quickly learned that it wasn’t matching our needs in the money-saving department. With Full-Service Movers you call and schedule a time for them to come and help you move and then you let them go to work. They will quilt-pad wrap your furniture, disassemble and reassemble furniture as needed, load it on the truck, drive it to your house, and unload it for you. To say that it is tempting is an understatement. All My Sons—They quoted me $4700. They had the same group of men that would be in charge of the entire process, and would not increase that $4700 during the move. Insurance was included in the price. ABF—ABF initially quoted me $2650 for 13 feet of room on their truck (this is semi-truck size). They told us that if we used less than 13 feet, they would drop $97 dollars off of the price they quoted for every foot not used. UPOD—Upod quoted us $4200, and after verifying with them that they had not misunderstood my house dimensions (I imagined the price would be much lower), I told them I was not interested. Curiosity more than anything will reel you in to look at these. I received several quotes between $1400-1600 for self-service movers. I’ll talk about these in a different section, but just know we did not go with them for specific reasons. My wife and I initially were drawn towards the lower price tag of Penske rather than ABF. However, after factoring in the gas we would have to pay to drive the truck 2000 miles, the prices appeared to even out. Plus, the additional comfort of driving our own car across country while my wife was expecting as opposed to an unfamiliar truck was very appealing. We eventually decided to go with ABF. It should be noted that an important aspect that we planned ahead for in choosing ABF including additional time before the move playing tetris with the ABF truck in an attempt to condense our load as much as possible. The way we could accomplish this is because they will drop off the truck when you ask and give you around three-five days before they need to pick it up again. We were able to load our apartment into 7 feet of the truck (as opposed to 13)—this led to ABF dropping the price we paid on the truck to $2060, over $300 savings on what we would have paid for Penske and that’s with the gas included. We loved our experience with ABF and would highly recommend them to anyone looking to move cross-country. 4. Know how much cubed feet your house/apartment is. This is important to know for 1st time movers. Moving companies will quote you based on the cubed foot of material you will be moving. They have formulas that help them understand how much you will be packing, and they will charge you based on that formula. My wife and I were renting an apartment, but did not own our appliances, including dishwasher, refrigerator, or washer and dryer. In addition, we did not have a lot of furniture. This led to us receiving gross overestimates on the amount of room we would need in order to move, which eventually allowed us to save money using ABF. If you do not know how much room you need in order to move, I would direct you to this blog article discussing it further: https://boxbrotherscorp.blogspot.com/2012/09/charging-moving-customers-by-cubic-feet.html. 5. Know what moving supplies to spend on/skimp on. Bubble wrap and saran wrap are vital if you are packing your own things. Plan on doing a Wal-mart/Costco trip and picking it up. It will save you from the wears and tears of travel on any furniture you don’t want to get scuffed up. But word to the wise: Be sure not to use just saran wrap on your valuable items—the scuffs that we did have when we unpacked our truck were due to our saran wrapping an item (like our solid wood bedset) that did not also have any bubble wrap on it. The items that had both emerged in pristine condition. Moving boxes can be picked up at so many major stores that it is not even funny. Make sure if you are trying to pick up free boxes that you get as many of them the same size as possible. Uniformly sized boxes mean you don’t have to play tetris as much, and it absolutely maximizes the amount of space you can use. Padding for us was using old blankets and sheets. This worked perfectly. We walked away from our move grateful we hadn’t picked up unnecessary moving supplies. Don’t close out your line of credit at your bank just yet. If you are thinking of purchasing a house after you move (like we were), getting rid of any lines of credit could potentially damage your credit score, leading to problems down the road for a house. If you are using a credit union, begin looking for credit unions or banks in your new area. Banks will often have more charges than credit unions, but can have a more national presence. If you decide to keep your credit union, which is not a bad option, recognize that there will be some drawbacks in your new location. They may not be able to immediately direct deposit to your credit union. Changing out debit cards in case of fraud becomes more of a hassle because you can’t just walk into the nearest branch and ask for a new card. 7. Consider Subscribing to Consumer Reports for 1 or 2 months for insights into new appliances. One of the things we worried about was finding appliances in our new home, as we were starting from scratch and had no idea how to evaluate all of the products we had to purchase. We purchased a one-month subscription to consumer reports and used it more times than we can count to look for all of our major purchases from cars and powertools to baby cribs and carseats. It is a great reference for providing a broad overview about a particular item we knew nothing about. 8. Start looking for new activities in the area you are moving to. We ended up leaving all of our friends and family out in Utah. A good way to meet people is through community sports or activities. You’ll find that if you are moving with a spouse that you will spend a lot of time with that person during the move, and spending time with other people will help you have fun during a stressful time in your life as well as give you a break from one another. You love each other, but after a 31-hour road trip…well, need I say more? This was something I wish I had done more of. Find local people attached to your new job, church, support groups, or any other ways you can think of to reach out. The people you contact will have a wealth of information about the area that you do not have. They can provide valuable insights into what areas are safe or not, the traffic that is good to avoid, and many of the major issues that might be in the area (we learned early on that bugs are a major issue in Columbia). The stops helped break up the trip into fun side adventures, and were all cheap/free opportunities to see the country-side. When we weren’t stopping at interesting stops, we were listening to Harry Potter and the Goblet of Fire in the car. The last CD finished a half hour after we arrived at our new house. We would be the first to say that we don’t have it figured out yet. Feel free to comment on anything that you feel we may have missed or any other moving tips that you would like to share.